72 MMS September 2017 mmsonline.com FEATURE came to in conjunction with L&S provided the solution that is now succeeding for this shop, the solution that might even of fer the potential to eliminate QA inspection once it is extended to a subsidiary shop that L&S owns. What Ms. Morlacci, Mr. DiNardi and the staff of L&S realized is that the data potentially provide simply a picture of what good performance looks like, what a good day at the machine looks like. And that picture alone can be enough. QA IS TOO LATE L&S is a contract shop serving the nuclear power industr y. Its principal product, accounting for about 80 percent of business, is fuel nozzles supporting the fuel rods within nuclear reactors. These box-shaped parts with many machined features are milled on five-axis machining centers out of 304 stainless steel. L&S ships about 2,500 of them per year. The problem Mr. DiNardi has long seen in processing these parts relates to QA. Specifically, the problem is the fact that many machining errors have been discovered only in QA inspection, which is too late. A dimensional error discovered here generally cannot be corrected. Instead, the part is scrapped, sacrificing about $1,500 of work and $1,000 of material. Even worse is the possibilit y of a problem making it through QA. That happened one time, Mr. DiNardi says. 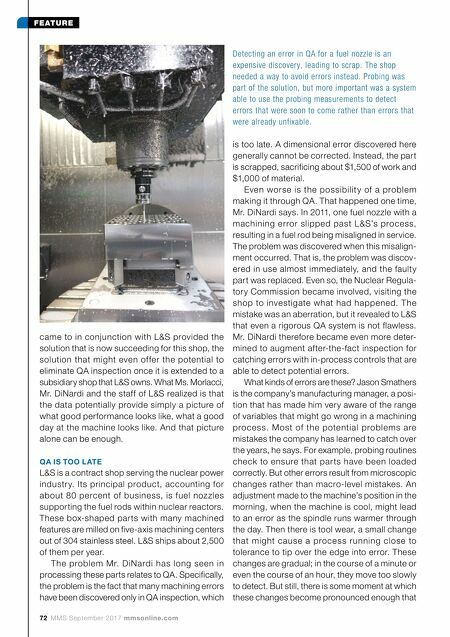 In 2011, one fuel nozzle with a machining error slipped past L&S's process, resulting in a fuel rod being misaligned in service. The problem was discovered when this misalign- ment occurred. That is, the problem was discov- ered in use almost immediately, and the faulty part was replaced. Even so, the Nuclear Regula- tory Commission became involved, visiting the shop to investigate what had happened. The mistake was an aberration, but it revealed to L&S that even a rigorous QA system is not flawless. Mr. DiNardi therefore became even more deter- mined to augment after-the-fact inspection for catching errors with in-process controls that are able to detect potential errors. What kinds of errors are these? Jason Smathers is the company's manufacturing manager, a posi- tion that has made him very aware of the range of variables that might go wrong in a machining process. Most of the potential problems are mistakes the company has learned to catch over the years, he says. For example, probing routines check to ensure that par ts have been loaded correctly. But other errors result from microscopic changes rather than macro-level mistakes. An adjustment made to the machine's position in the morning, when the machine is cool, might lead to an error as the spindle runs warmer through the day. Then there is tool wear, a small change that might cause a process running close to tolerance to tip over the edge into error. These changes are gradual; in the course of a minute or even the course of an hour, they move too slowly to detect. But still, there is some moment at which these changes become pronounced enough that Detecting an error in QA for a fuel nozzle is an expensive discovery, leading to scrap. The shop needed a way to avoid errors instead. 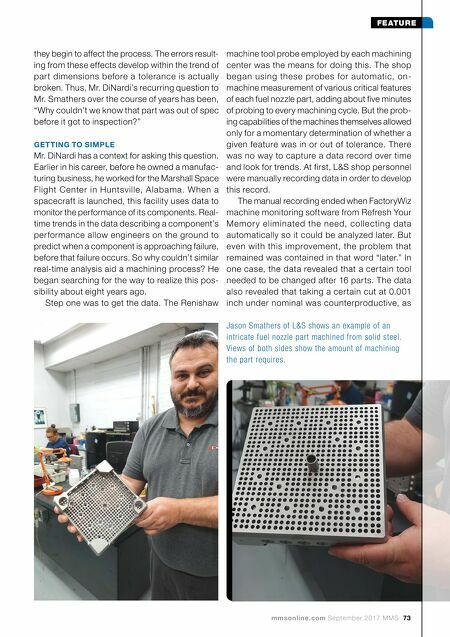 Probing was part of the solution, but more important was a system able to use the probing measurements to detect errors that were soon to come rather than errors that were already unfixable.